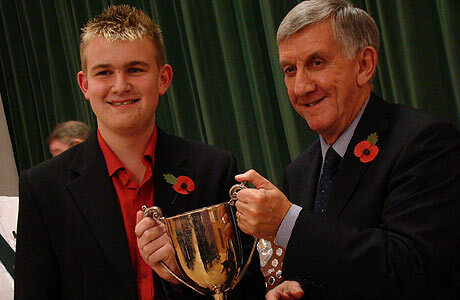 On Sunday the 1st November the band's quartet were named the British Open Senior Quartet Champions 2009 after winning the competition held at Dukinfield Town Hall, Tameside. The reporter from online band magazine 4 barsrest said "Over the years, some great ensembles have had their names engraved on the Quartet Trophy – from Hanwell in 1944 through the likes of Foden’s, Black Dyke (A & B quartets) and of course, the most famous foursome of all – the great GUS (Footwear) lads that made it a hat-trick of wins in the late 1960s." This year another famous banding name will be engraved on the trophy – that of Hammonds Saltaire. The foursome of JJ Lees and Jamie Smith (cornets), Helen Varley (horn) and Matthew Allsop (euph) may not yet be household banding names, but if they carry on with performances of this quality you never know. Conducted by Morgan Griffiths, their performance of Gilbert Vinter’s ‘Elegy & Rondo’ (written for the famous GUS quartet) was compact, balanced and almost error free. Neat individual touches from all four players and an admirable sense of control (the piece is a hard one on the lip) gave them the title by what would have been a clear cut margin from adjudicators Malcolm Brownbill and Thomas Wyss." Jamie Smith is pictured accepting the trophy from Malcolm Brownbill.